Hard to believe it but Fourth of July was a month ago now. Summer is officially flying by. This year, to celebrate our nation’s birthday, we had an old fashioned barbecue with burgers, dogs, and cole slaw. But of course I had to bring in some Indian flavor to the menu. As I mentioned in an earlier post, I had a sneaking suspicious that tamarind chutney would make an excellent sauce for wings and I thought Fourth of July was the perfect time to test out my theory. I followed the genius chicken wing recipe from the very meticulous folks over at Cook’s Illustrated which is seriously a game changer if you haven’t tried it. Perfectly crispy skin and tender meat every time. 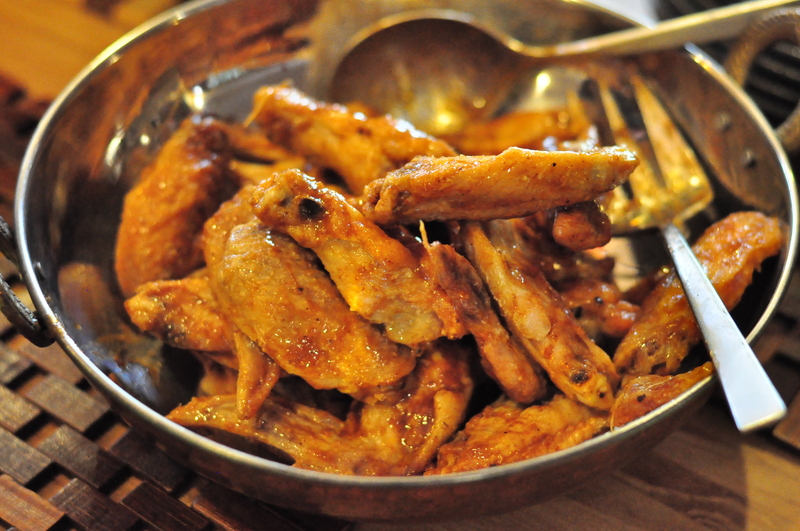 Having this recipe in my wheel house has basically stopped the need for me to order wings at a restaurant. ever. again. They are that good. And they are even better with sweet and tangy tamarind sauce dripping off them. If you already have a stash of tamarind chutney, all you need to do is add a bit of butter, and a hit of sriracha (or your favorite hot sauce) and you are in business. These are prefect for late summer get-togethers and early Fall football games. And yes, I typed the F word. As much as I adore the summer season, Fall is around the corner. Hopefully this recipe will make the seasonal transition a bit easier on our tastebuds at the very least. Addictively spicy and tangy sauce coats crispy oven baked chicken wings. Pat the wings dry with paper towels and place into a large ziplock bag. Combine the baking powder and salt and add to the bag. Seal and toss to evenly coat. Arrange the wings, skin side up, in a single layer on the rack. Bake on the lower rack for 30 minutes and then move the wings to the upper rack. Increase the temperature to 425°F and roast until golden brown and crispy, 40-50 minutes. Rotate the sheet halfway through baking. Remove from the oven and let stand for 5 minutes before transferring to a large bowl and tossing with wing sauce. Enjoy hot. Stir together the ingredients in a bowl until throughly mixed.